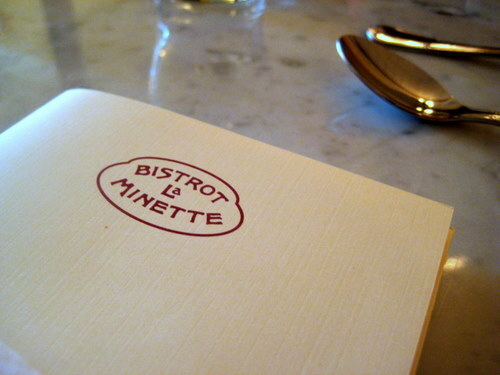 I feel full of shame that I hadn’t gone to Bistrot La Minette earlier. I’ve passed by it dozens of times. It’s right across the street from Beau Monde. I always saw it and said to myself, hmm, I wonder if that place is any good. I just had no idea that it was an authentic French bistro and that it would be so darn good. Maybe I was afraid of French food. I just don’t know. But I’ve finally righted my wrong. So they do a prix fixe on sundays, $29(!) for four courses, and the menu changes weekly. And man, it was stupendous. There are some cute tables outside and when you go in, it immediately feels like you’re in Paris. It really is quite transformative. What do we start with? Baguette! 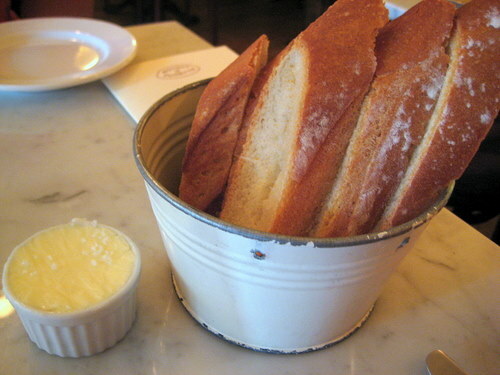 So good and served with the most delicious salted butter. 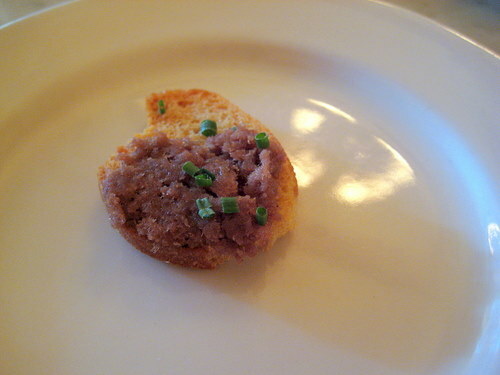 Here’s the amuse bouche – rillet on a little mini crostini. Our first official course was the Soupe Parmentier. 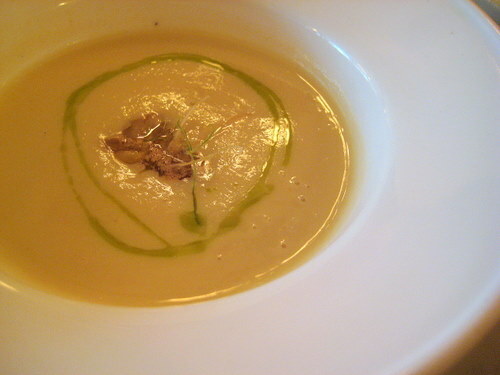 It was a winter root vegetable soup with fried leeks, butter-roasted chestnuts, and parsley oil. This was so velvety smooth and rooty. It definitely is made with roots, but nothing was overly bitter. The chestnuts were so good! I wish there had been more of them! Next up was the Grillé au Cantal. 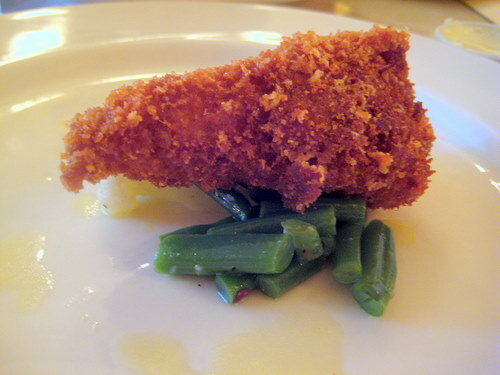 It was a hunk of breaded and fried Cantal cheese with cauliflower and haricots verts in a lemon vinaigrette. It was like cheese tempura! It was a bit on the overly crunchy side, but who doesn’t like fried cheese! 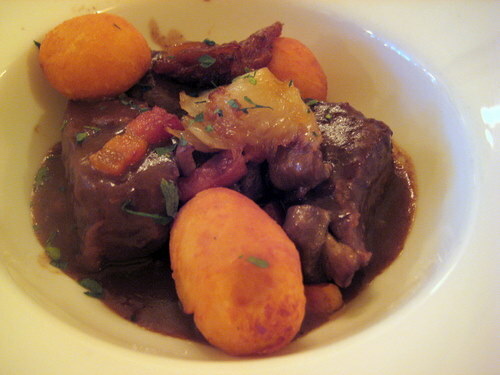 The main entree was the Bœuf Bourguignon. You know what this is, it’s a beef stew with mushrooms, lardons, pearl onions, and potatoes dauphine. This stew had an intense flavor and the meat was tender and juicy. My favorite thing about this were the potatoes dauphine! They like deep fried mashed potato balls! So the puffed outside is a little crispity but the potato on the inside is whipped and creamy. It was so awesome. 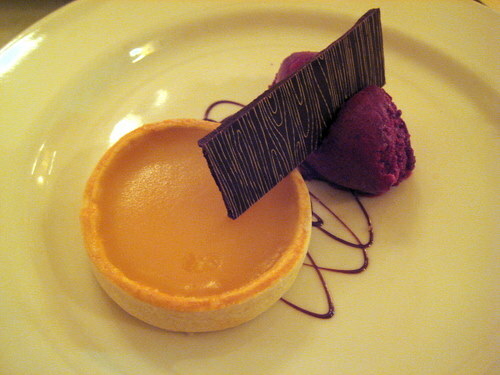 And finally, for dessert, the Tarte au Citron et son Sorbet Cassis. It was a super duper lemony tart with a cassis sorbet. The whole thing was great, especially the cassis sorbet. It was so much food! And it was all delicious! We were both absolutely crazy about it. The service was also excellent, from our extremely blond server. He would have looked extremely at home in a Russian figure skating program. Early on when we first got there, which was like early bird time, it was pretty much deserted. But later in the night, we were happy to see lots more people show up. And you should show up too!